The most expressive ingredient of the gentleman’s wardrobe, a necktie, is never relegated to an afterthought at DRESSED TO THE NINES. For the tie to be right it must hold prominence as the final touch--the statement of elegance of the true gentleman. DRESSED TO THE NINES’ fine neckwear imparts the creative European influence that distinguishes our hand-finished silk neckwear from all others. 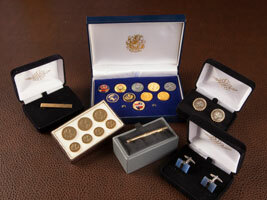 Also, it’s no surprise that so many gentlemen have become fans of our unique cufflink collection as well. With both formal and dressy options as well as fun motifs to match every personality, cufflinks afford an excellent opportunity to indulge in a little jewelry, even as a conversation piece and a personal expression of taste.